Have you ever wondered why Jesus, who was sinless, would need to be baptized? 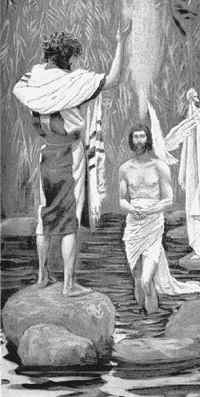 After all, baptism is a sign of our sins being washed away, and Jesus didn’t have any sins to wash away. Or did he? Jesus was sinless, and yet he, the sinless one, bore the sins of the whole world. Paul tells us in 2 Corinthians 5:21 that God made Jesus to be sin for our sakes, even though Jesus himself was sinless, “so that in him we might become the righteousness of God.” In keeping with God’s purpose, Jesus was baptized for our sakes, not for his own. His baptism, like his death and resurrection, was a dramatic expression of God’s grace toward sinful humanity. When we are baptized, we are baptized into the baptism of Jesus Christ — a baptism that is linked to Jesus’ sinless life and his death and resurrection on our behalf. The Son of God became one of us in order to represent all of us before God. This is what Christians mean by “representative atonement.” Because Jesus is human, one of us, he is able to represent all of us before God. But Jesus is more than our representative. He also took all of our sins upon himself, bearing our sins and their penalty in our place. That is what Christians mean by “substitutionary atonement.” Jesus represents us before God, and he also substitutes for us before God. In substituting for us, he carries away our sins; in representing us, his righteousness is attributed to us. He is our “alpha and omega.” Our salvation is in Jesus Christ, and him only, from beginning to end. The voice from heaven said to Jesus, “You are my Son, whom I love; with you I am well pleased.” But remember, Jesus is God’s Son, beloved of God, for our sakes and as our representative. In saying this to Jesus, God says it to every person for whom Jesus died and rose again. In Christ, God says this to you and he says it to me. In his baptism for us, Jesus embodies from both sides the promised relationship of love between God and his people. As God, he represents God to us. As human, he represents humanity to God. This relationship that God has created between himself and humanity in the person Jesus Christ is the fulfillment of everything God promised to Israel, to the House of David — and through Israel to all of the world. In Christ, God has demonstrated in person his complete faithfulness to his covenant of love and redemption. God saves us because he loves us and wants us saved, and he did it in Jesus Christ. Religion teaches us to think of salvation in terms of laws, that is, God saves the lawkeepers and destroys the lawbreakers. But the gospel tells us that salvation is God’s gift to sinners: God makes sinners righteous in Christ, who is their perfect representative before God. That’s why we need to trust him for our salvation — it comes only through him, and not through our deeds. It is his commitment to us and his faithfulness to us that saves us, not our commitment and faithfulness to him. When we trust in Christ, we participate in Christ’s perfect commitment and faithfulness on our behalf. It is only because we are God’s chosen ones, holy and beloved, that we can clothe ourselves “with compassion, kindness, humility, gentleness and patience” (Colossians 3:12). Because God identifies us with Jesus, and this even while we were still sinners (Romans 5:8), we are freed to walk with him in the paths of his love. God acted in Christ to make us righteous. We receive his righteousness; we do not create our own, and in receiving his righteousness, we begin to walk in his ways. Jesus did not come to vindicate the law, but to vindicate people — sinners, to be precise. Christians should not fall for the religious (as opposed to gospel) idea that God is more concerned about the law than he is about people. Paul wrote: “But when the fullness of time [the “Today” of Hebrews 3:13 and 4:7] had come, God sent his Son, born of a woman, born under the law, in order to redeem those who were under the law, so that we might receive adoption as children” (Galatians 4:4-5, New Revised Standard Version). When God says to Jesus, “You are my Son, the Beloved; with you I am well pleased,” he is saying it also to all who are in Christ, because Christ has identified himself with humanity as one of us (Hebrews 2:16-17), both substituting for us and representing us in the presence of God. Because of sin, the only future for humanity is disaster — unless, that is, God is faithful to his covenant love. The biblical descriptions of hell, whether pictured as outer darkness or a fire, with all its torment and anguish, are what we would have to look forward to were it not for God’s absolute faithfulness to his promises of forgiveness and redemption. Jesus took on himself the horror of hell in our place, but hell could not defeat him or hold him. He broke its power, disarmed it and led it captive in his parade of victory over all powers and authorities (Ephesians 3:8-9; Colossians 2:13-15; 1 Peter 3:18-22). Captivity of every sort, whether the captivity of hell, of addiction, of human tyranny or of sin, has all been led captive by Jesus, our victorious Savior. Even though we know this, and even though we are fully committed to living godly lives in the light of Jesus Christ, we still fall short and do things that are contrary to the love of God. But don’t let that get you down. That is how things are right now, but it will not always be so. The day will come when the new creation that God has already made you to be in Christ (2 Corinthians 5:17; Galatians 6:15) will be fully unveiled (Colossians 3:1-4). When that happens, there will be no more crying, no more pain and no more death (Revelation 21:4). Even now, our hope lies in this: God has proven in Christ his love for us and his faithfulness to us (consider Romans 5:6-8). He has made our cause his own. He has taken responsibility for us — sins and all. He has taken us under his wing, and he will never let us go. That is why we trust him. God, who proved himself faithful to faithless Israel, is the same God who is faithful to faithless you and me. He is the same from the beginning, which means he has and always will be for you, working to help and to heal, and not to condemn (consider John 3:17). If you have turned your back on God, don’t ever think he has turned his back on you. Quite the contrary. He’s got the porch light on and dinner on the table, waiting for you to come home. How is Jesus’ baptism related to our baptism? Why did the voice from heaven say, “With you I am well pleased” (Mark 1:11)? Is it hard for you to accept the fact that in Christ you are beloved by God (verse 11)?